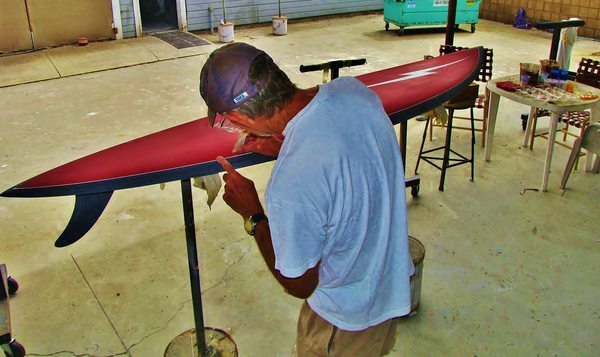 Chuck later returned to Santa Cruz where he made boards for O’Neill along with his custom orders before finally returning to Ventura with his wife Linda where he continued to build boards for his loyal followers. I thank him for the inspiration he has given me." Chuck Vinson passed away this morning. Chuck was a longtime friend since the days of Thought Surfboards down by the SB Courthouse. He was a quintessential craftsman, and I remember him calling me up once and asking me how I was doing my pinlines so perfect. This came as quite a surprise, as his quality was off the Richter scale, and I took it as a great compliment. I guess that event is really symbolic of how discerning a craftsman Chuck was. In fact, when I took over O'neill's in 1980-81, and revamped the surfboard program, I included Chuck among a very select group of guys making boards for the O'neill label including Croteau, Thomas, Schroedel, Coletta, & Andreini, and Junod. Chuck will be missed. There will be a paddle out for Chuck, Sept 3rd at Faria.